My first post in 2015 won’t be a reflection of the year we have just left behind. I have spent many hours looking through my photos and remembering what was, and as usual, feeling thankful to still be alive. My summer expedition to climb in the Andes left me feeling pretty drained for a few weeks after, and the numbness in my left thumb (still) is memory enough of that! 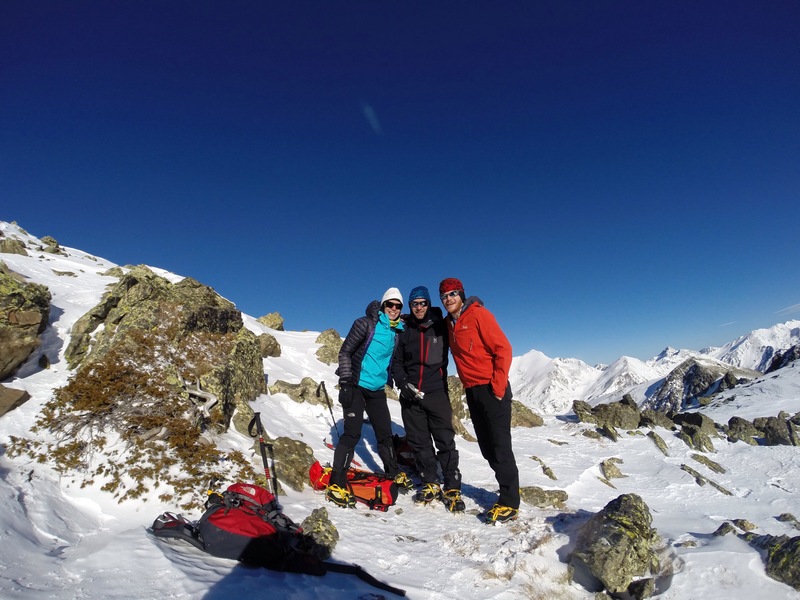 Instead, I’m writing up my latest adventure, a post Christmas mini trip to Andorra, and a chance to be reunited with 2 of my Huascaran Expedition team from July. After realising that there is Infact no airport in Andorra (who knew?! 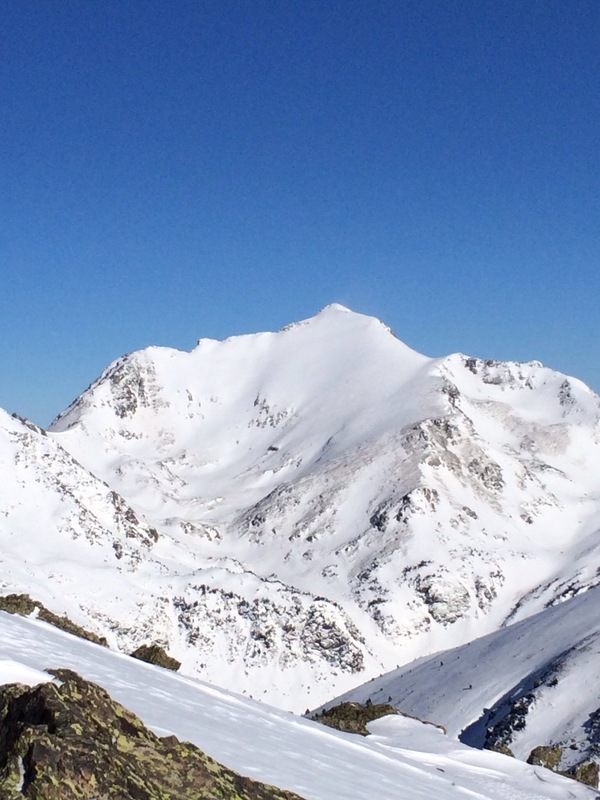 ), a quick flight to Barcelona followed by a 3 hour bus journey soon had me up high and on the edge of the Pyrenees, and in a range I’ve not had much chance to climb in recent years, but one that, with a huge dumping of snow, looked just ace and in great condition. 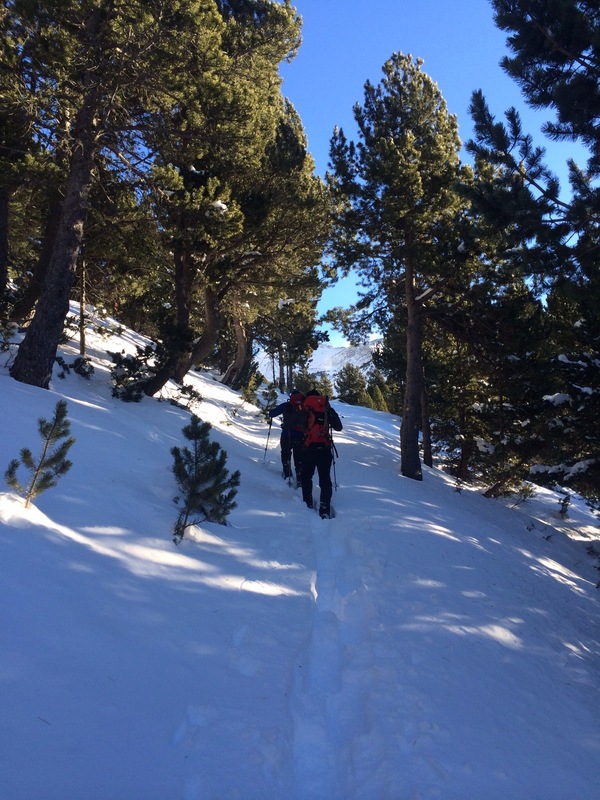 Our team of 3 set off, fully laden with snow shoes, crampons, and a load of festive cheer…the snow shoeing through waist deep powder in beautiful, untouched pine forests a real treat and the perfect way to feel human again after Christmas. 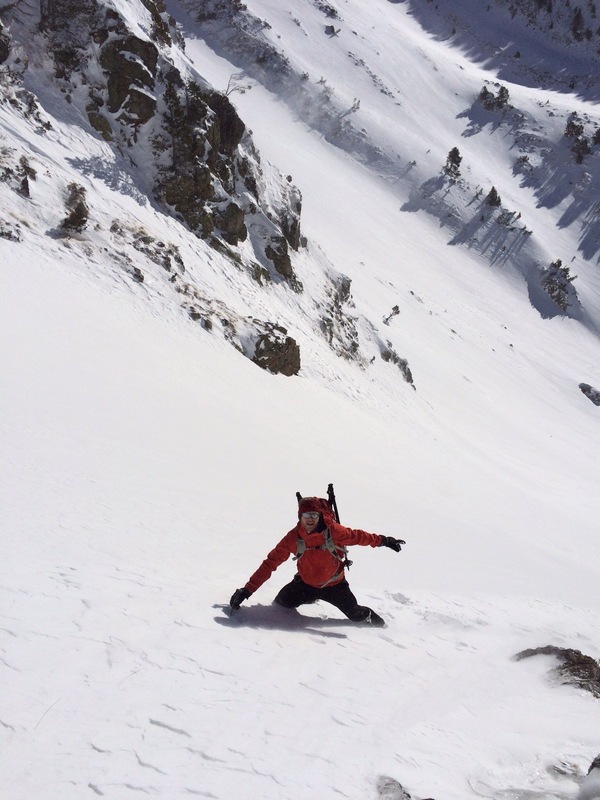 The first test came when we hit the steeper sections of the climb, on our route up Pic De Arcalis, we were committed on steep ground, but still wearing snow shoes. If it wasn’t so funny, then we would probably have had time to realise it was actually pretty sketchy, the long drop down was enough to cause serious harm if we slipped. But we didn’t. And so up we climbed (snow shoe staggered!). 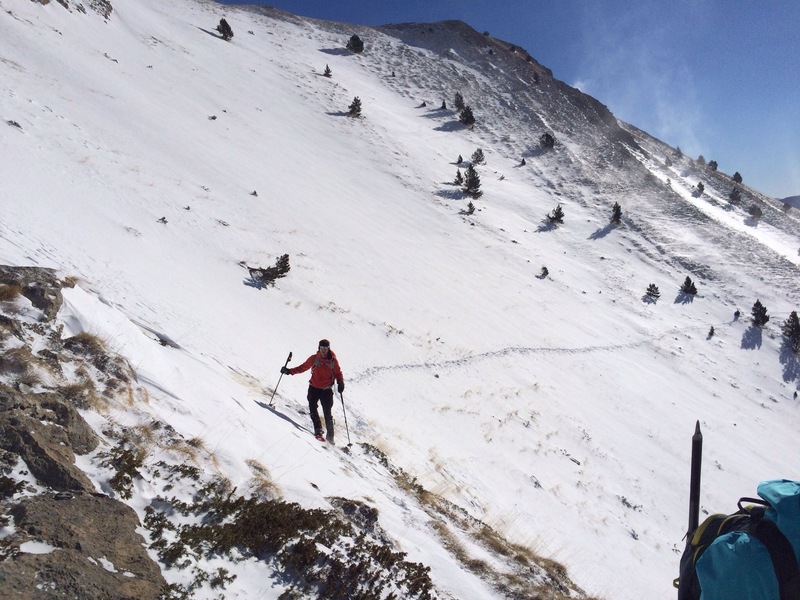 We hit an even steeper rock section, and made the switch to crampons, our goal being the ridge line above us. And then it happened. The wind that had been battering us since we left the safety of the low lying forests had picked up, creating near white out conditions, one giant gust forced me to drop to one knee, quite tricky when you’re on a 45 degree snow slope. The main casualty however, was my climbing partner Mike, or more specifically, his whole rucksack! The wind picked it up, the open end acting like a wind sock, and threw it down the mountain, back the way we had climbed. Rookie mistake Mike. 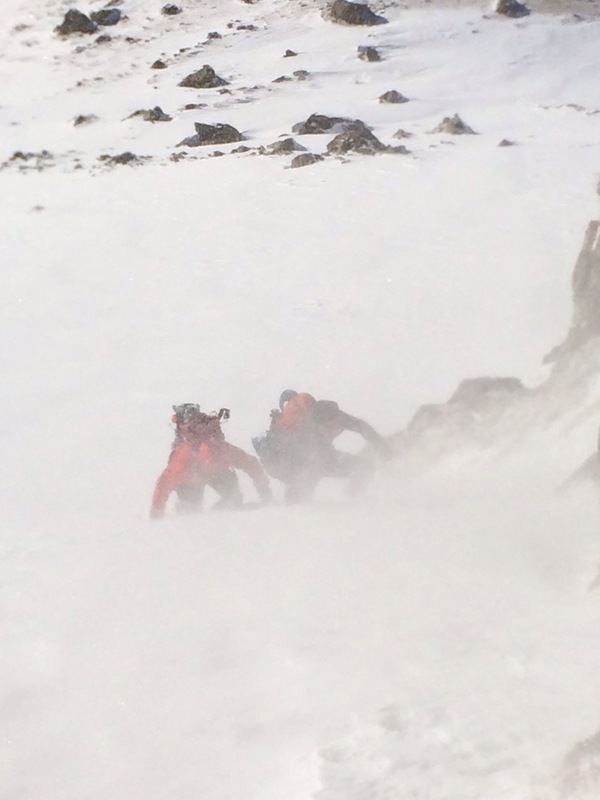 The bag was open, the contents now being dispersed across the snow and valley some 300m below us. Climb over. Our second and third days were much more rewarding, and less full of accidents. New Year’s Eve 2014 will go down in history as one of my most memorable, and probably my coldest! Fast forward to 3pm on New Years Eve, I found myself up climbing a steep section of snow covered ice, the others following my line, me taking the brunt of the snow/ice barrage from the valley above, really not knowing what lay ahead. We were in a gulley, climbing up a 60 degree section, my view of the top of the gulley limited. This was perfect Avalanche territory, and here we were 3 small dots in the middle of a sea of snow. The deep sections were deep, but it didn’t look too layered, and so up we climbed. Our reward, well, there was no Avalanche, and the summit views were stunning. Aside from Anna’s right eye freezing shut (it happens), we all survived unscathed. Well, I’d say Mike’s pride may just be returning now! Some of the best shots/views. Thank you Andorra.